The lineage of drag race engines – or any race engine for that matter – is written within eyeshot of that shelf of broken parts. This is an ancestry of a learning curve. As power increases, the stress on internal engine components also increases. 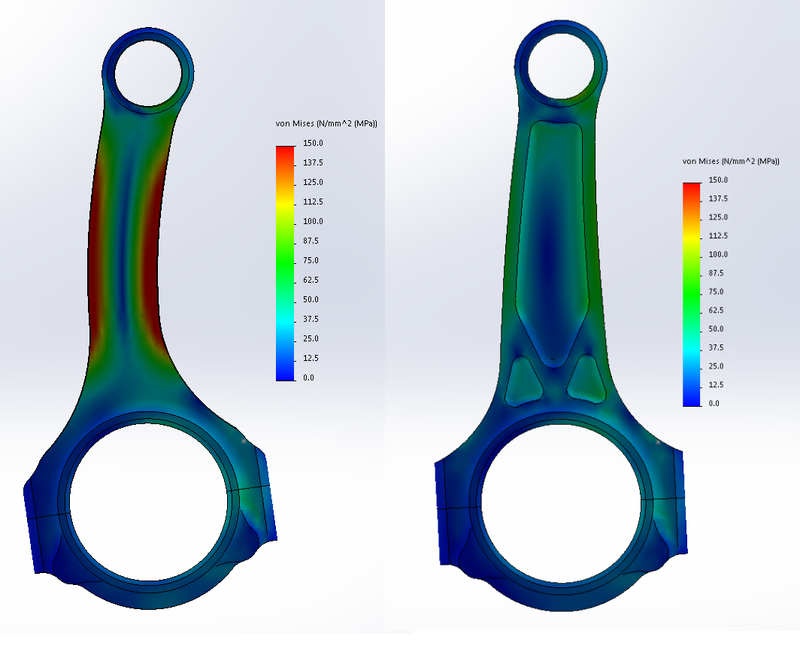 As piston designs improve to take the abuse of immense cylinder pressures of especially turbocharged race engines, that load is passed right on to the connecting rod. It’s clear there was a need for a stronger connecting rod for these high output turbocharged, supercharged and nitrous-assisted engines. Good connecting rods were literally bending under the incredible cylinder pressure loads of 2,000 hp small-block and big-block engines as well as their four cylinder cousins. This has renewed the connecting rod controversy of H-beam versus I-beam. 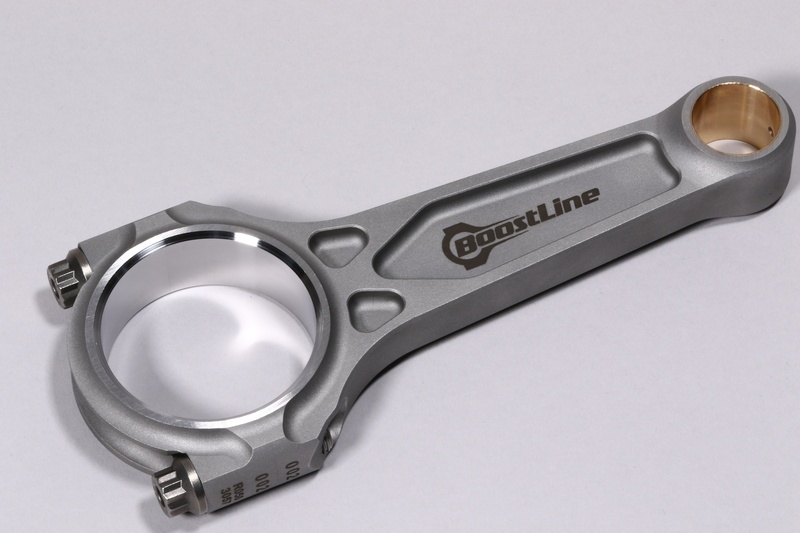 The BoostLine’s unique 3-pocket beam makes it easy to identify. This design incorporates the best features of both the H-beam and I-beam connecting rods. Its 4340 forged steel body combines H-beam mass with I-beam strength. Both sides have their proponents; we won’t review it all here. We’ll just leave it at the H-beam is typically lighter while the I-beam is generally acknowledged as stronger. Weight plays a big part in the overall consideration with regard to how well the rod can handle what engineers call ‘tensile loading’. Smart engine builders know that while boosted engines can bend a connecting rod with compressive loads, engine speed also plays a big role. This FEA illustration reveals the hidden strength of the BoostLine rod. Compressive loads have increased dramatically in boosted engines but this rod can handle the pressure. With every spin of the crank, the piston and rod must come to a complete stop and accelerate in the opposite direction. The change in direction from Top Dead Center (TDC) downward is especially abusive on connecting rods. This action yanks on the connecting rod, attempting to separate the cap from the rod. 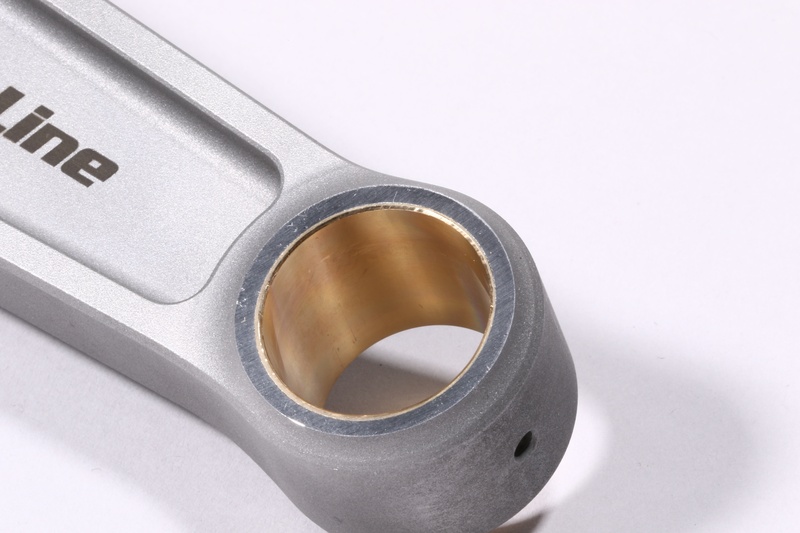 So the combination of high RPM with increasingly high compressive cylinder pressures has again pushed the boundaries of both compressive and tensile loads a good steel connecting rod can handle. The challenge was to increase strength while minimizing mass. Generally, H-beam rods tend to concentrate stress at the radius between the beam and the big-end of the rod. 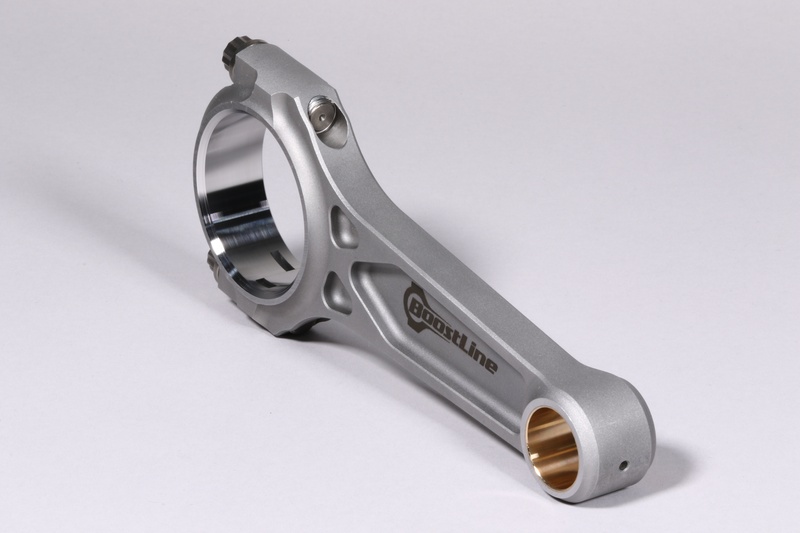 The BoostLine 3-pocket plan dramatically improves the rod’s big end stability under tensile loads. Triangles are inherently strong and you can see this influence in the pocket shapes. This strength is especially critical at high RPM, where loads increase across the entire big-end area of the rod. All BoostLine rods are individually inspected using a coordinate measuring machine (CMM) that is used to custom-match sets of rods to incredibly tight tolerances. Most rods are matched to be within 1 to 2 grams of overall mass. When you consider an LS rod weighs 700 grams, that’s an incredibly tight tolerance. To learn more about this, watch the video below. It was the demands in this area just above the big end that resulted in the patent-pending 3-pocket design. This arrangement drastically increases the rod’s bending strength giving it a 60 percent improvement in bending stress than a similar H-beam design, making it ideal for forced induction and high cylinder pressure engine combination. Simultaneously a 20 percent stress reduction in tension was observed with the BoostLine design. These improvements were then applied to a high-quality 4340 chrome moly steel forging that is heat treated, shot peened, and fitted with ARP2000 capscrews before final finish machining. The ARP fastener is a critical component in the design using ARP’s heavily alloyed tempered steel that produces a tensile strength of 220,000 psi. Brittleness is often an accomplice of high tensile strength, but the ARP alloy has the ability to accommodate the loads that attempt to pull it apart, giving it both strength and malleability. The radius area between the beam and the big-end is an area of intense stress and load. The 3-pocket design increases strength while minimizing a mass increase. Plus, this also reduces big-end compressive forces under load which makes life easier on the bearings. The story doesn’t end with fitting the fasteners however. 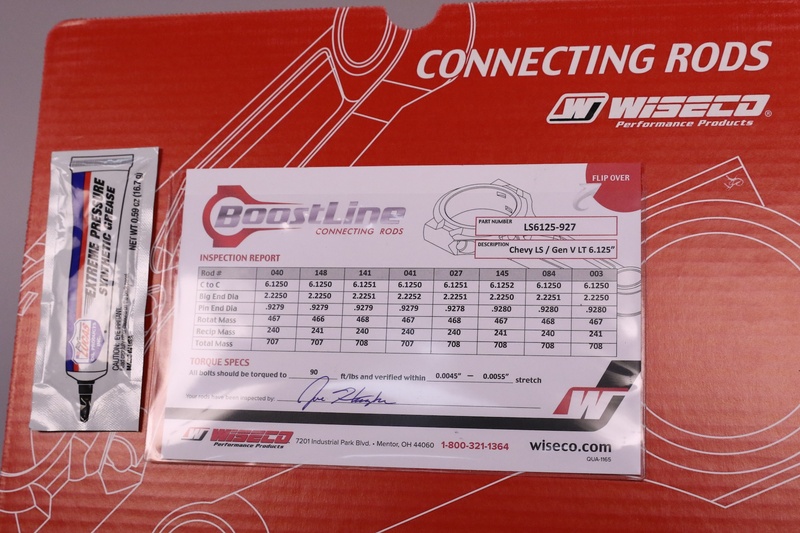 The BoostLine rods are next individually measured using Wiseco’s coordinate measuring machine (CMM) that carefully logs a literal blueprint of each individual connecting rod using custom jigs created to hold the rods in place for measurement. Once a production run of rods have been measured, they are individually screened and combined in a custom-matched set based on no fewer than six different measurements. As an example, the rods are measured for overall length, big- and small-end diameter as well as rotating and reciprocating mass, and finally total mass. A typical set of 6.125-inch BoostLine rods for an LS engine will offer an overall length variation of less than 0.0002-inch and a total mass variation of one gram. Given an average total mass of 707 grams, the weight of oil attached to the rod or piston during use will easily exceed the difference in mass of the rods. 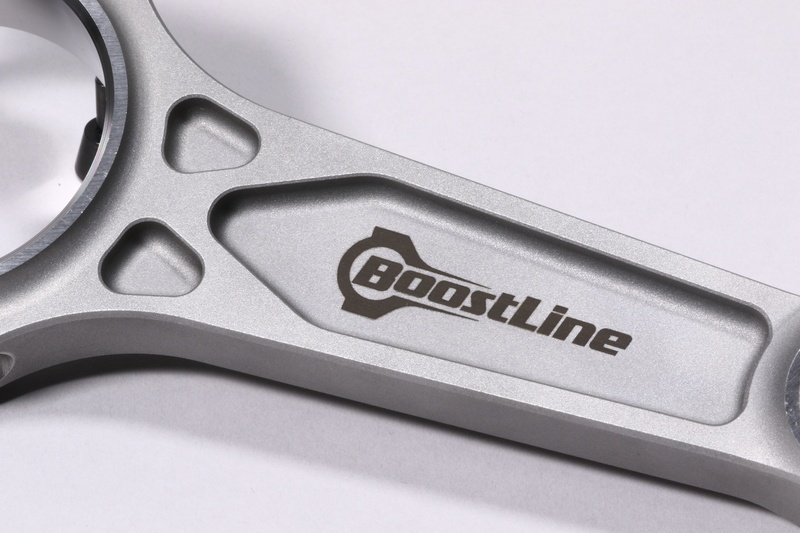 We took a look at just the overall length variable between a package of 8 BoostLine rods. If you look closely at this report that comes with every set, the variation in center-to-center length on this set of 8 GM LS 6.125-inch rods is no more than 0.0002-inch. Once the rods are custom selected as a package, an individual report is created for each set and included with the rods. It’s also noteworthy that the rods are not just tossed in a box. When you open the BoostLine packaging, the rods are completely separated by thick foam so the rods are protected from shipping damage. Plus, each rod is vacuum-wrapped in plastic for corrosion protection. All BoostLine rods are fitted with ARP2000 capscrews that offer between 200,000 and 220,000 psi tensile strength. Included in the packaging is a complete quality-control report for each individually numbered rod. The specifications for each rod are listed on the report so that the engine builder can tell at a glance the specs for each individual rod. Another important spec is the ARP torque recommendation that lists not just the spec to be used with the package of Lucas fastener assembly lubricant, but also the capscrew’s stretch range that should be verified. This deserves a bit of explanation. Torque, by itself, is really just an indicator of friction – which is resistance to movement as opposed to a gauge of the actual fastener’s elongation. The problem with using simple torque as the method of evaluating tension is that friction varies tremendously during assembly. Ampco bushing material is used in the small end and Wiseco sets the pin clearance at between 0.0009- and 0.0011-inch of an inch. This allows the engine builder to custom set his wrist pin spec should additional clearance be necessary. Another important step is to torque and re-torque each cap screw a minimum of three times before measuring the actual stretch relative to the applied torque. This process burnishes the interface between the under-head area of the capscrew and the face of the connection rod. As these surfaces create a wear pattern, it also drastically reduces the measurable friction between these surfaces. Tests have shown that more than half of the total friction created during a torque sequence is created in this interface area. This reduction in friction combined with the proper lubricant to remain stable after several applications significantly alters the amount of stretch applied to the capscrew even though the applied torque remains the same. This is a critical step in qualifying each BoostLine rod fastener because an under-torque on these critical fasteners is just as dangerous as too much stretch. Too little stretch allows the fastener to eventually work itself loose as a result of its reduced clamp load. ARP’s recommended stretch numbers are created to elongate the fastener to roughly 75 percent of the bolt’s maximum stretch figure. It’s important to get as close to the final stretch number as possible. Optimizing the actual rod bolt stretch number is critical to getting the most out of the investment. All of this is tied into the pulling ultimate performance of the BoostLine rod. 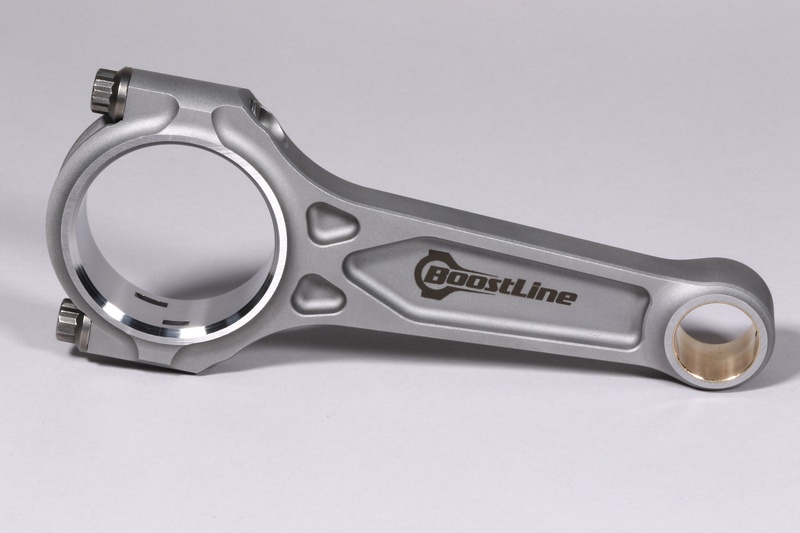 As you can see, there are multiple beneficial aspects to the BoostLine connecting rod. You don’t need us to tell you that this is a critical component when building an engine capable of four-digit horsepower. Combining 21st Century power with ultimate reliability makes the BoostLine rod an easy choice for your next engine build.